The Pacific Northwest…bounded on one side by the pacific ocean and the other side is the mountainous Rocky’s. It’s perfect for finding a two-lane crowd-free by-way and rolling past acres of lush forest. Those acres can turn into meandering hours of riding the countryside on a motorcycle. 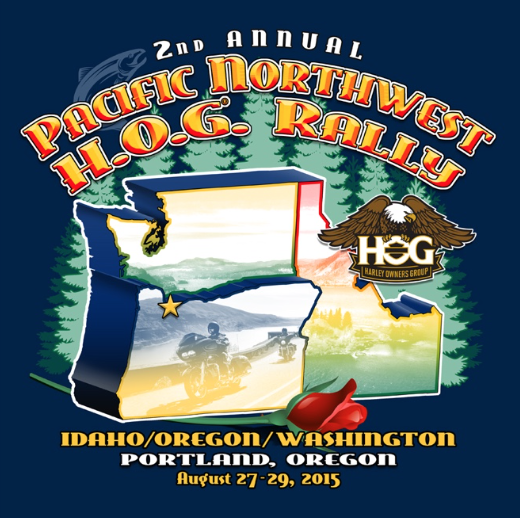 In fact, the Pacific Northwest HOG rally will be hosted in the picture-esq Northwest (Portland) in a couple of weeks where we will deliver the aesthetic vision of why we ride! Welcoming the 1000’s of riders to the adventure will be hot and dry weather. Not only will they encounter the best weather temps, but they will also have to deal with wildfires. Yes, the west could be described as being on fire! The fires across the region have forced evacuation, burned down structures and created breathing issues for some. Twenty minutes outside the Portland metro area the air is thick with particulate and smoke permeates the sky for miles across the region. In Washington state over a 1000 people have been evacuated in Chelan county. The Warm Springs fire (Countyline 2 fire) in Oregon has exploded into the largest fire at 36K acres. U.S. 26 is closed at Oregon 126. According to NatGeo, on average more than 100K wildfires clear 4-5 million acres each year in the U.S. In 2014, some 1.2 million acres burned in Oregon and Washington and sadly this year it’s looking like a repeat. In scanning the reports I got to thinking about the last time I’ve taken a motorcycle trip during the summer that wasn’t marred with a wildfire. Of course it depends on how many miles I’ve traveled, but in a typical week long ride during the summer I realized that it’s been a fair number of years where I didn’t pass near or through a burning wildfire during a ride. I’ve had multiple trips to Sturgis. Through Yellowstone Park, through Glacier National Park – both with fires on multiple trips. There was U.S. Route 550 or the “million dollar highway” that had a San Jan National Forest fire. There was Beartooth Highway (U.S. Hwy 212) and a lingering wildfire. I’ve taken a couple extended trips up north to British Columbia Canada and the land of lumberjacks was on fire both times. In most all cases we were not close enough to see flames, but dark smoke and particles filled the sky for many miles as we navigated across the country. 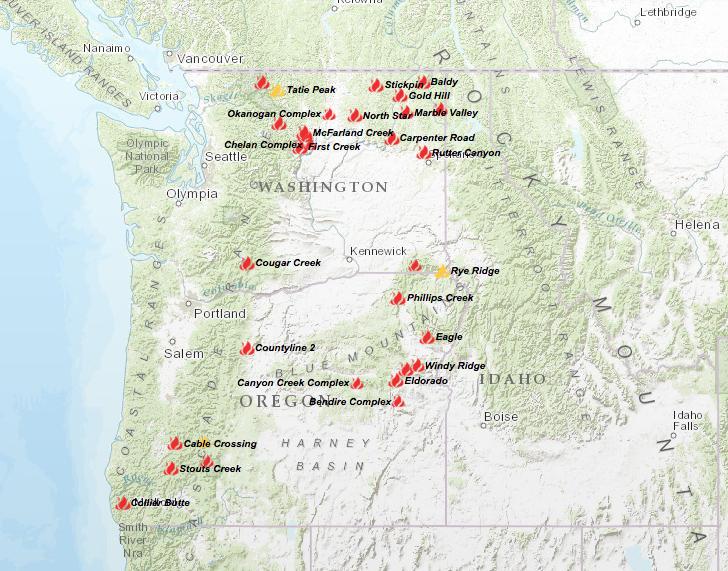 In Washington and Oregon there are now 31 major wildfires currently burning. See the map. In Canada BC, there are even more. In addition to the economic woes that these fires cause it does makes one wonder whether motorcyclists should even consider traveling the west during the height of the summer fire season. But, life is for living and I’m not talking about the thrill of a car ride snaking through the marquee Going-to-the-Sun-Road in Glacier. It’s about feeling small in a very big world and how that is a great thing on a motorcycle. 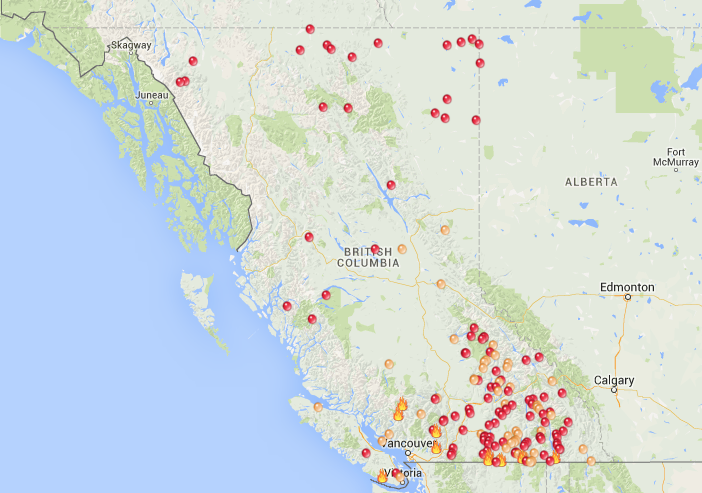 So, I’ll continue to plan motorcycle trips to ride the west – wildfires and all! Sure some of my photos will be filled with smoke obscuring the mountain views but, just know that I’ll have a big smile underneath that slightly wetted down dew rag covering my face! Photos courtesy of the Oregonian and NWCC. Bruce Hansen knows the roads around Washington, Oregon, Northern CA and British Columbia. 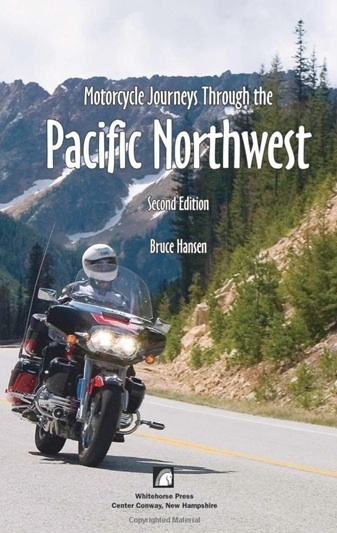 His 2nd edition of the “Motorcycle Journeys Through The Pacific Northwest” (Whitehorse Press – 288 pages) reads like a conversation with your buddies. The full color photos in the travel guide will have you thinking about summer and is sure to get your enthusiasm up for the open road. This is an update to his popular first edition and riders can learn from the 30+ trips that Hansen has planned which includes topographical maps for each trip, specific directions, and tips on the best places to eat, sleep, and visit. Hansen guides riders through the areas around Seattle and Portland, up and down the coasts of Washington, Oregon, and northern California, around the volcanoes’ of Mt. Saint Helens, Mt. Hood, and Mt. Rainier, across the desert of Oregon, out to the San Juan Islands, and over the border into parts of British Columbia. When not riding Mr. Hansen teaches writing through Portland State University. It’s a favorite among motorcycle enthusiasts and I wanted to pass it along. You can pick up your copy HERE on Amazon. Photo courtesy of Whitehorse Press/Bruce Hansen. Happiness is doing what you love and given the northwest rain, gale force winds and cold weather means – I’m not feeling the motorcycle love! So, what else is there to do, but look ahead to the new year and map out some rides?! Drive a portion of Route 66 – Ideally this trip would include a large chase truck which is better suited to bringing back memorabilia collected on the way to wherever, but the route being considered is Phoenix to Flagstaff and Grand Canyon. Then on to Kingman with a drive-by in Laughlin for the late April River Run. Ride the ferries – British Columbia offers up remarkable scenery and where else do you go during the U.S. July 4th holiday?! Nothing is more spectacular than a ride through Olympic National Park, catch the Port Angeles Ferry to Victoria then Buchart Gardens with dinner and libations. Make a return trip to Sturgis – we’re 202 days out and this year marks the 70th anniversary. It was just a couple years ago several of us rode to the Black Hills. It wasn’t the first time, but it did celebrate the inaugural Black Hills State University dorm room in Spearfish, SD. The Sturgis rally defines the term “cluster” so I’ll likely settle for a day well-spent in and around the little South Dakota town…followed by a hot shower and a soft bed before quickly departing to enjoy more of the ride. Oregon State H.O.G. Rally – 2010 marks a combined Washington and Oregon State H.O.G. Rally. It starts in Pendleton, OR on August 24th and ends in Coos Bay, OR on August 27th. A week of riding and nearly 1500 miles with 8 dealer stops. The current ride route is through 4 states. Good Rockin’ Tonight – I’m talking Street Vibrations in Reno, NV (September) and the reference is to cover bands playing rock hits from the classic acts back in the day. We’ve got a new culture these days as folks go to dance clubs and move to the bass-heavy productions of studio wizards…but, back in the day it was Montrose (some of you are old enough to remember this exact performance!). The 19 year old Sammy Hagar stood on stage and rocked the crowds. However, Street Vibrations is where the cover bands imitate the greats. What’s in your future ride inventory? If you’ve never driven a motorcycle on the Going-to-the-Sun road it’s clearly one of the top 10 national park experiences you should have. We rolled out early on the “Sun Road,” as it’s known, and were treated to views that exceeded the Canadian Rockies. Largely because the cloud coverage made way for some spectacular open air views in the various pull outs. There is significantly less traffic (shuttle buses and tourists) when traversing the park East to West. We didn’t have to contend with crowds at any of the prime view pullouts. From pockets of thick, forest lining the many lakes to Logan Pass to the mountain-goat-crowded alpine high country and then back down to West Glacier on the park’s western border… the road offers a visual assortment of outdoor views that anyone will enjoy. The “Sun Road,” which initially was called the “Transmountain Highway,” rolls through the Crown of the Continent and offers up some road entertainment. It’s narrow, precipitous in places, and in a constant state of repair due to the annual freeze-thaw cycle. It wasn’t always clear that the “Sun Road” would follow its current path. There were debates over the best routing of a cross-park road. Some wanted it to run all the way to Waterton Lakes in British Columbia, and others were arguing for it to go by Gunsight Pass. In the end the U.S. Bureau of Public Roads (the precursor to today’s Federal Highway Administration) decided the current route made the most sense. Once that decision was made, National Park Service landscape architects worked with Bureau of Public Roads engineers to, as much as possible, blend the road into the mountain environment. 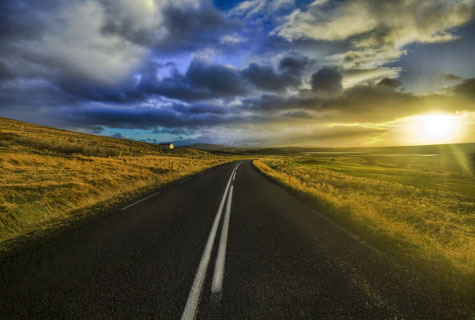 The road is truly an engineering marvel and is a National Historic Landmark. It spans about 50 miles through the parks interior and winds around mountainsides and cliffs. Planners insisted that the bridges, retaining walls, and guardrails be made of native materials and to this day that mind-set prevails. We pulled off at the Logan Pass visitor center. This area is pinched tightly between Clements Mountain and the southern tip of the Garden Wall, and offers up terrific views that carries the Continental Divide through the park’s interior. Farther north are the bulk of the park’s glaciers and you soon realize that it would take a lifetime to really know everything that the park has to offer. Many of the park visitors motor up the pass aboard a Red Jammer, one of Glacier’s renowned fire engine-red, open-air touring buses that debuted in 1937. Supposedly they gained their nickname for the way drivers “jammed” their way through the gears. We made our way down to West Glacier where it looks like time has stood still in this remote corner of Montana. The log buildings haven’t changed much since they were built in 1938. Any “inappropriate development” has been curtailed and the village has maintain its historic character. There was a lunch break in Kalispell and we had a great drive along Flathead Lake and rolling farmlands. The weather was comfortable as scattered clouds floated along the mountain range. We were making good time for a layover in Missoula. Just after St. Ignatius we connected with Hwy 200 and about 20 miles prior to I-90 we hit major road construction. It was as if the contractor won every bid to re-surface the road, rebuild water culverts and widen bridges. It was massive and to be candid riding a weighted down motorcycle on very loose and deep gravel was intense. The “Motorcycles Use Extreme Caution” was an understatement! We finally arrived in Missoula and met up with the other half of the posse from when we split paths in Canada. Dinner and refreshments at MacKenzie River Pizza Company was a great break as we compared riding route and construction stories. The next morning all I could think of was — No forest fires here! This is usually the season for hot, dust-dry and smokey air in Western Montana. Maybe an occasional thunder shower with little rain, but lots of fire-starting lightening. However, our Missoula departure was met with flash-flood pouring rain. We’re talking a wet-to-the-bone soaker! Even with a full-face helmet it was miserable as we experienced 167 miles of heavy rain on I-90. It didn’t stop until we exited in Coeur D’ Alene and was a half-hour into eating our lunch at a Denny’s! I experienced for the first time rain gear seepage and damp jeans. WTF?! Sure that amount of rain qualifies as a season-ending event to the wildfires, but it was so intense and broad across the state that even I was looking for a culprit… maybe that hydrocarbon use is REALLY to blame for the glacier shortening and sea level rise which in turn effected the rings around the sun and the atmospheric motorcycle riding conditions in Montana? A quick iPhone WeatherBug scan indicated that Spokane was at the edge of any possible rain and we decided it was time to head as directly as possible to sunnier sky’s. By the time we hit Ritzville then south on Hwy395 toward the tri-cities it was re-hydration time and the layers started to peel off. After several more wind surfing riding hours through the gorge we made it home. A couple of closing thoughts on this great 8-day, ~2000 mile ride. The internet is for sharing. It’s where we go to reveal our thoughts and describe experiences. When going on a motorcycle road trip you encounter an array of fascinating landscapes, people and structures. This trip brought with it some weather challenges for which we were mostly prepared and we adjusted to them. There was also a lot of terrific riding, fun and now a historical travelogue. At the end of the day, when you get home, it’s about having a few moments away from the daily routine and being able to share those memories with friends and family. Thanks to the posse for a great time! We set out of Kelowna on BC97 along the lakeside, leaving both town and slow moving traffic behind. The hazy smoke filled skyline followed. The road twisted and turned making for a spectacular ride with great views. In the town of Sicamous the hazy smoke subsided as we headed east on the green and white maple leaf highway marked as the Trans-Canada Highway — also known as Hwy1. Just prior to Revelstoke we passed through Craigellachie which is the site of the “last spike” completing the original Canadian transcontinental railroad back in the late 1800’s. When riding, you never know what is around each bend, many of which are around rock faces, so there may be fallen rock or wildlife on the road. But, on the other hand, you need to relax and mix riding with taking in the view which we did as we traveled along Hwy1 through Revelstoke and passed through the Selkirk Mountains and Glacier National Park (Canada). At the summit we stopped at Rodgers Pass. There are a number of snow sheds and earth dams used to protect the highway from avalanches and the area is home to the largest mobile avalanche program in Canada. At Golden we connected with the junction of Hwy95 which is west of Lake Louise and passed through Yoho National Park. It runs along the southern-most part of the Canadian Rockies just west of BC and the Alberta border. At Kicking Horse Pass we rolled over the continental divide and the Spiral Railway Tunnels. They were built to increase the length of the railway track and reduce the grade as trains made their way up a considerable ascent. Sometimes called the “Big Hill” it had a ruling gradient of 4.5%…one of the steepest in North America prior to the Spiral Tunnels opening in 1909. Alberta’s Mountain Parks are the jewel of the Canadian Rockies. Approximately 7600 sq miles of preserved wilderness it’s easy to see spectacular scenery, watch wildlife and enjoy what has made the area famous. We rode by the Weeping Wall, a massive limestone cliff with a number of waterfalls seeping out. The day ended damp and cold – around 55 degrees by the time we dropped into Banff, Alberta. In the late 1800’s workers from the transcontinental railway chanced upon simmering hot springs and the area became Canada’s first national park – Banff National Park. At 4540 feet in altitude it is Canada’s highest town. And with a cold front that had moved in we felt and saw the precipitation, fog and wind shifts of that altitude. It was early August yet it felt like mid-October in Oregon! We had a scheduled layover in Banff and spent “tourist” time kicking around town, trying local pubs and wandering the Fairmont Banff Springs grand hotel and national historic sites. The hotel is steeped in history having been built back in 1888 and there is a long list of famous guests who frequented the resort. We didn’t stay at this hotel. I didn’t get the sense that many guests had turned in their Mercedes-Benz to lease a Hyundai! In fact, our entire time in Canada seemed to indicate that the worst of any recession was long over for the folks who pass the puck. In the hotel lobby we met up with some riders who came from Calgary and soon learned there were many wild cards in the weather forecast. It was going to be cold and wet. Ugh! Our original route had us heading east toward Calgary, but that pesky cold front brought torrential rain and high winds killing one and injuring 15 people. Over refreshments we decided to avoid Calgary as nasty weather and hail was a certainty and we didn’t want any part of it. As a side bar, my iPhone app, “WeatherBug” didn’t work in Canada. I could get temps and current conditions, but I couldn’t pull up Doppler radar to re-route around any storms… bummer. We determine that the west side of Banff National Park offered a reduced possibility of rain so, we would back track to Hwy 93 through Kootenay National Park. It would mean a longer 400+ mile day to reach Highway 89 and the “Going to the Sun Road” in St. Mary, Montana, but riding dry was preferred over cutting 100 miles off the route in the rain.